Sony's top console has never been cheaper. With so much chatter about the next generation of consoles hypothetically appearing in the near to moderately near future, we quickly approach that awkward time when you don't really want to buy anything currently out there. After all, who wants to drop a handful of Benjamins just to find out his or her purchase will be made obsolete within the year? While it's mostly impossible to break free of the obsolescence-fear cycle completely, certain things can help. And one of those things is a giant, lip-licking discount. 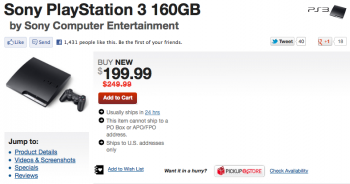 Behold: GameStop's $199.99 160 GB PlayStation 3! Console hardware discounts are hard to come by; not only is Sony likely still losing (or darn close to losing) money per console sold at the normal $249.99 price point, but retailers almost never up charge the merchandise from that cost to remain competitive. The resulting situation is what's nearly always a fixed cost until a system gets slapped with a permanent price slash. Could a price drop across the board be on its way, or is this simply a wacky limited offer? The answer is unclear, but the 20% off isn't just a leaked image for some future promotion. It's legit. You can snag a brand new PS3 right this very second, right here. Granted, $199.99 isn't an amount you're likely to find beneath the couch cushions (unless you're Richard Garriott), but it's a far cry from the system's original retail launch price of $599.99 for the top-of-line 60GB model.